Noémie Goudal is a young, immensely talented French photographer whose work is taking Europe by storm. Since August 2015, she has had solo exhibitions at FOAM (Amsterdam), Photographers' Gallery (London) and her latest show, Cinquième Corps, opened at Le Bal in Paris on February 12. As Le Bal describes her work, "Goudal creates ambiguous photo-sculptures by superimposing handmade paper structures on a natural landscape. These architectural (staircases, domes, towers) or cosmic (ellipses) elements are placed against blank oceans or stretches of desert. Looking at these dreamlike shapes, the spectator’s gaze easily discerns the traces of artifice (creases, imperfections, strings, and wires) characteristic of two-dimensional objects designed for the sole purpose of the photograph...Goudal blurs our points of reference. Her works oscillate between hallucination and fact. They hold the mirror up to modern life with its ungraspable yet contradictory levels of truth." After seeing pieces of her work in several different locations, managing editor Alexander Strecker ventured to her atmospheric studio in the 18th arrondissement of Paris to find out more from the artist herself. The following text is the result of their extended conversation. Jantar Mantar is a park-sized collection of astronomical instruments in Jaipur, Rajasthan which dates back to the 18th century. Built by the Rajput kings, its structures are capable of producing a wide variety of calculations: the azimuth of the sun, the declinations of the stars and the elliptical coordinates of the planets. But the largest object in the entire observatory is the Vrihat Samrat Yantra or, "great king of instruments." This is the world’s largest sundial, capable of measuring time to an interval of 2 seconds. As impressive as the structure is, it is also, in 2016, faintly ridiculous. A towering building, nearly 100 feet tall, capable of nothing more than the banal task of telling us the time. Accurate down to two seconds, yes—which makes it about half as precise as your plastic wristwatch. Much ado about nothing, right? From such a point of view, it is a dubious honor to be the world's largest sundial. It's like laying claim to the world's longest aqueduct or owning the castle with the thickest walls—the last and greatest example in a line of thinking that has long since been cast aside. Yet today, we revere our surviving aqueducts, the fabled pyramids, the mysteries of places like Stonehenge and Carnac. But what if Stonehenge is just an obsolete calendar, so many useless tons of futilely positioned stone? Is its obsolescence fair cause for dismissal? In our age, we take for granted the daily pilgrimage to gleaming office buildings and enormous venues for sport—but perhaps, some day, these structures' limited functions will seem as meaningless as the ruins that they lord over now. But ruins aren't meaningless. There are reasons that we visit them in droves, that they continue to exert some sort of magnetic attraction on us. To be sure, this attraction can be different for different people: historical, spiritual, social. All of which points to the fact that a place like Stonehenge—whatever its long-forgotten function—has since transformed into something else. Indeed, all of these mysteriously attractive ruins force us to confront a question: what is the lasting function of the structures that we build? Are buildings able to only serve one, discrete purpose? Returning to Jantar Mantar, today we are not struck by its uselessness. Far from it, we are moved by its simplicity, strangeness and beauty. Its imposing sundial is no more a giant pocket watch than the Lascaux cave paintings an outdated kitchen calendar. Part of our attraction to these places is their ability to thrust us into the midst of other worlds. They are portals to another place and time; they allow us to be travelers into both the past and the future. The past, because if we close our eyes, we can imagine what kind of people expended so much effort to understand the infinitely distant movements of nigh invisible celestial bodies. And the future, because we can only muse over what the fathomless generations to come will make of our proudest contemporary accomplishments, our ruins-in-waiting. All of which brings us squarely into the world of photographer Noémie Goudal. Her impressive body of work uses photography (while also drawing on sculpture, architecture, optics and a host of other disciplines) to seamlessly blend the built environment and our imaginations, creating rich spaces filled with questions about function and purpose. Implicitly, even the medium of photography is implicated in this question: besides showingus something out in the world, what else is photography capable of? Take, for example, her "Observatoires" series (the first part of her work which led me to recall Jantar Mantar). These seemingly concrete structures are, in fact, nothing more than paper backdrops. Solid-seeming materials made out of cut-up photographs of "real" buildings. First constructed in the studio—and then, re-staged and shot in humble, natural locations: an empty beach, a grassy hill. But to reveal the "reality" behind these images does them no justice. Even seeing them on a screen, digitally flattened to the depth of a pixel, requires some imagination. But to see them in person is to stand in front of the stage of a magician. A two-dimensional surface—the picture plane—and a simple wooden frame are transformed into a portal, capable of drawing us into another world. On a much smaller scale, but with no great reduction in transportative power, her "Observatoires" (and much of her other work) hold the same potential as our most evocative ancient sites. In short, to spend time with Goudal’s work is to open ourselves up to new possibilities and new ways of relating to the space around us. After all, the camera can frame anything—but where that frame can take us is limitless. This blurring of reality and imagination began as a (productive) constraint during Goudal's student days in London. While bound to the studio as an art student, she loved to travel and photograph, to see as much as she could of the wide world around her. This constraint made her think about the relationship between the real and the invented. What was out there, what was in here—and what was the difference? So, obligated to return to the walls of her creative space, she began to create structures in the studio which would allow her vision to extend back out to the world. Ultimately, she reasoned, her brain thinks in two-dimensions, and her retinas are just flat, tiny portholes from her mind onto the world. These facts were the same, no matter where she was. But the camera, and the photographs it produced, were windows. She could create whatever she wanted in front of that window and if it was enticing enough, the viewer, through looking at her work, would be able to enter into her built environments and be transported from where they stood. Essentially, she was asking, where does the world of the image end and our world begin? Goudal captured this blurring neatly in her work "A Study on Perspective." A seemingly straightforward structure—from one perspective—is quickly revealed to be a clever construct: a 3-D image, really. This duality is present throughout Goudal's art. Usually, when we talk about photography, we speak of a "vision." This vision may be capable of eliciting stories and emotions and memories but ultimately, it is flat. Meanwhile, in architecture, we talk about space. How does a structure create a space that we can move through and relate with? 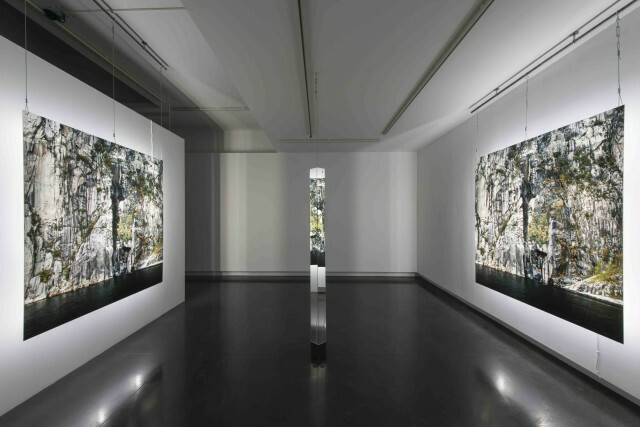 But Goudal's photography seems to ask us: what if this distinction were arbitrary? What if (flat) photographs could create space and massive structures were reduced to paper-thin ephemerality? This is the inside-out world where Goudal thrives. From a distance, some of our most iconic buildings really do look pretty flat. Imagine theBurj Khalifa, the world's tallest building. Any picture of a structure that large will inevitably render the subject two-dimensional, almost unbelievably so. Photographically, the 500,000 tons of real, massive material become nothing but wafer-thin layers—concrete, glass, light and volume, reduced to the depth of the picture plane. In fact, almost all photographs can feel this way: a bit of sky, some paper, and the plane of a camera. A vision, yes, but a flat one. Yet in a catching photograph, in one that has the power to draw us in—the imagination of the viewer is given the space to enter, to explore. These are the spaces that Goudal will push into even further at her upcoming exhibition at Le Bal, Le Cinquieme Corps. Take, for example, her fascination with stereoscopes. Typically thought of as a 19th century oddity, these machines are the embodiment of Goudal's fusion between representation and life. Stereoscopes are built around taking two slightly different images and, by presenting them to the left-eye and right-eye at the same time, are able to conjure up the appearance of a three-dimensional world. Picture, then, what happens when you produce a stereoscopic image of a landscape. First, you begin with a real landscape, out in the world. You make two pictures of it, slightly different. These become two-dimensional representations. Then you put those pictures into a carefully calibrated machine and voilà—it is recreated in three dimensions. But only, note, in the eyes of the viewer standing at a certain point. And so: the world is reduced to flatness and then brought into rich, voluminous existence again—all in the space of our own minds. Indeed, the entire science of optics hinges on harnessing light to shape our vision of the surrounding world. In other words, light—a massless stream of invisible waves/particles—has the power of creation, or at least, the rendering visible of things around us. Optics, then, appears as a third leg (next to photography and architecture) in Goudal's drive to discover how space and light interact in the mystical process of creation. For example, in this exhibition, Goudal is working with a team of masters-level opticians to construct a very large stereoscope within the walls of Le Bal. The size of the device will give Goudal the power, through a complex and fine-tuned manipulation of mirrors, to shrink down two large images and produce a much smaller three-dimensional world. Thus: a smaller final image in dimension, but one that the viewer's eyes and mind will be capable of venturing into and inhabiting as a fully embodied space. Goudal's work is often compared to theater—each of her photographs a stage, a place for play. But there is a key distinction between the two that Goudal insists upon: theater is temporal while Goudal's work is personal. Personal because it asks the viewer to build a world for themselves, in whatever timeframe they see fit. While theater necessarily exists in time, Goudal's work aims to open up a timeless moment, a frame onto another world where the viewer is capable of making their own time and their own space. Yet unlike theater, nothing forces you to stand and look at Goudal's work. There are no curtains, no stage lights, no intermission, no applause. This means you are free to walk away at any time. But there is a beauty in this quality because it means there is also nothing stopping you from becoming infinitely lost—an image has no ending in where it can take you. And so, we return to architecture. But with a new understanding: architecture whose main function is a haven. Because whether a building—and a space—was designed at one specific moment as a sundial or a stadium or a place of worship, it is in its function as ahaven that any structure can persist as a meaningful place far long after its initial function has faded from view. In the same way a photograph can invite you into a timeless world and provide a haven away from the stream of daily life, so can a well-situated building—as an eternal sanctuary. Similarly, in constructing her exhibition at Le Bal, Goudal faced the challenge of building a space that would evoke all the thinking that exists in her work. Of course, the images have already been made, since this is largely a retrospective exhibition, so Goudal called upon architecture (and optics) to create a haven for her art. In other words, a place that will fully express her ideas while also leaving enough open space for interpretation; a place where the viewer will be free to wander, explore and get lost—in the gallery and in their imaginations. The exhibition "Cinquième Corps" will run at Le Bal in Paris from February 12 - May 8, 2016.